Simon Lloyd is University Archivist and Special Collections Librarian at the UPEI Robertson Library, a portfolio which includes responsibility for the LM Montgomery Institute collections. Simon received his BA from the University of King's College (1994) and his MLIS from Dalhousie University (1997); he has been at UPEI since 1999. In addition to Montgomeriana, his professional interests include: the collection and preservation of published and unpublished documentation of PEI and Atlantic culture and heritage (and the use of digitization, enriched meta-data, etc. to improve access to same), archives and recorded information management (RIM), information literacy, and copyright. On its 100th anniversary, we are pleased to celebrate one of the greatest treasures in the LM Montgomery collections housed at the UPEI Robertson Library: this copy of Montgomery’s The Watchman and Other Poems. Purchased at auction for the LM Montgomery Institute in 2002, with generous support from Dr. Fred and Mrs. Shirley Hyndman of Charlottetown, this particular copy is of exceptional interest and value. Even without these remarkable features, an early edition of The Watchman remains an important piece of Canadian publishing history: released in 1916 by Toronto’s McClelland, Goodchild and Stewart, The Watchman was Montgomery’s first truly Canadian book publication (previous Canadian editions of her books having appeared only under license from her American publisher). 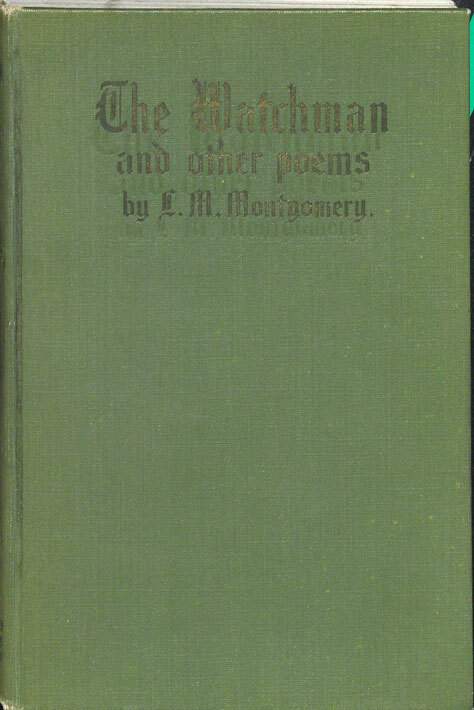 It was also the only volume of Montgomery’s verse published during her lifetime. Montgomery was a prolific poet earlier in her writing career, having published scores of poems in numerous periodicals in the late 1800s and early 1900s, and was eager to release some of this work in book form. Montgomery’s original publisher, L.C. Page of Boston, had dismissed her request to publish The Watchman, noting that poetry did not sell, and this may well have been the final breaking point in a professional relationship already made miserable by Page’s domineering and insensitive handling of Montgomery’s work. In any event, McClelland, Goodchild and Stewart’s willingness to publish The Watchman helped launch a long and productive relationship between Montgomery and her Canadian publisher: all the books she published thereafter, 14 in total, were handled first by McClelland and Stewart — as the firm became known — and simultaneously in the US by Frederick Stokes of New York.